The annual Primary Athletics competition was held on a slightly cloudy day, perfect conditions for over 1000 young athletes. 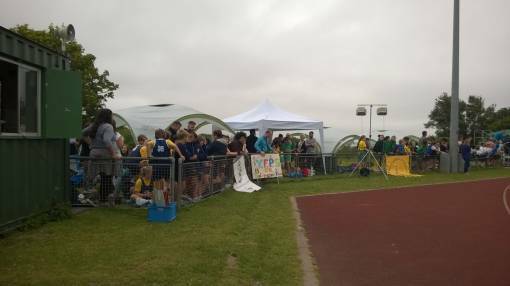 Many teachers, who have been attending the annual meet for years, arrived as early as 8am to reserve the best spots around the track and put up their gazebo’s ready for a full day of athletics. Each school brought a variety of children from Years 3, 4, 5 and 6 to compete in track, field and relay events. Each child could compete in one track, one field and one relay event. Schools were divided into three categories: Minor, Intermediate and Major. They are put into these categories based on the number of pupils on role in KS2, so that the biggest primary schools in the city are competing against each other, and the smaller schools are competing against each other to give all the pupils a fair chance at success. The day started with a flag ceremony, a tradition that started in 2012, with two representatives carrying the flag of their school. During the morning, heats were held for all of the track events, with the top two runners from each race going through to the final, held in the afternoon. The field competition was a straight competition with each child getting three attempts at their chosen event and their best jump / throw recorded. Clearly it was an extremely exciting competition as not one but two ladies went into labour during the day; we hope their babies arrived safely, and hope to see them in 7 years when they are old enough to compete! In all of the events, the children who came 1st, 2ndor 3rdin their finals received a certificate and the winner also got a medal. The four children who broke records, strangely all set in 2009, also received a special certificate of their achievements and their names have gone down in the archives. In the past every primary school competing have been asked to provide one teacher to act as an official on the day. For the first time, young leaders were used to marshall the events, and did a fantastic job. Many of the students have been actively involved in running PSSP events throughout the year and their experience showed with a smooth competition running ahead of time. They were enthusiastic, organised and great with the children. Many teachers have extended their praised to the young leaders with some even stating that they were better than the adults! A huge thank to the leaders from Stoke Damerel and Hele’s.